You need to investigate the world of work for a number of reasons. The most important is to determine what occupations and jobs best match your skills, interests, values, and personality. You could just comb through the “want ads” in the newspaper, but that’s letting the world randomly match you with a job. To ensure that you find a job in which you will excel and find enjoyment, you must take a proactive role in finding the job that is a good fit. You’ll obtain realistic and accurate information about different occupations. You’ll have an idea of what educational classes and training to pursue. You’ll gain confidence by becoming familiar with the language and concerns of the world of work — an important quality in any job search. You’ll hear about the “hidden” job market — jobs that are available but have not been advertised. You’ll learn how and where to apply for jobs. You’ll make numerous contacts and when you’re ready to look for work, you’ll know who to call. You’ll identify work industries that interest you and can use your skills. Beginning to explore the opportunities in the vast world of work can be done in a variety of ways. The following pages will provide some detailed examples on how you can complete this task. You’ll be glad to learn there is not one “correct” way to do it. How you begin depends on what you know or don’t know. 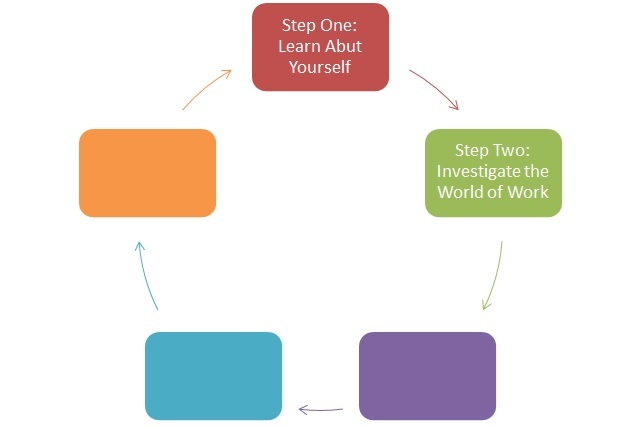 Start your exploration of the world of work by looking back at Exercise 5 in this Guide. Using the Holland two or three code assessment tool, look at the list of jobs that you feel best suits you. Pick a few of the jobs that sound most interesting as a starting point. Now that you know what job or work industry you are going to investigate, you can complete various tasks, and explore many resources available to you. Regardless of where you begin, as you explore, always keep in mind YOUR skills, interests, hobbies, values, and personality preferences. Helpful Hint: Are the jobs you’re investigating a match for your talents and interests? Get feedback, especially from people working in those jobs, and from people who know you well and who can help you evaluate potential matches objectively. The following section offers a variety of places where you can go to get help with your world of work exploration. Lifelong employ-ability — Strive to be employable—to have the skills that employers value—so you can find work easily even if you get laid off. Don’t expect to have lifelong employment, especially with one company. Diversity — Appreciate and work with cultural differences. Employers value this skill because the labor market has more women, older people and people of different races and ethnic groups than ever before. Computer skills — Develop strong computer skills and up date them regularly. Every industry prefers workers who have these skills. Math, Science, and English — Develop strong math, science, and communication skills. Employers always need people with these skills. Customer service — Always demonstrate a positive, helpful attitude toward customers, supervisors, and coworkers. Employers value good customer service skills because gaining and maintaining customers is crucial, especially in a weak economy. Economic awareness — Pay attention to the local, national, and global market. Jobs are created and destroyed because of technological advances, the economy, and corporate restructuring. Prepare for it. Post high school education — Obtain an education beyond a high school diploma. It’s the number one way to achieve and maintain a middle class lifestyle or,in many cases, to be self-supporting. With an advanced education you will remain employable. Continuous learning — Constantly upgrade your skills. Employers want to know what you’ve learned recently, not what degree you earned ten years ago. Education costs — Find employers who will train you. Since the price of college and technical education will continue to rise faster than inflation, academic help is valuable. What Do Employers Want from Employees? sound decision regarding a plan of action. Researching — The ability to search for needed data and to use references to obtain appropriate information. Organizing — The ability to arrange systems and routines to maintain order. Speaking — The ability to express oneself fluently and intelligently. Writing — The ability to use proper spelling and grammar to express ideas. Human Relations and Interpersonal Skills — The ability to relate well to persons from varied backgrounds. Quantitative and Scientific Reasoning — An understanding of the basic concepts and principles of mathematical and scientific processes. Ethical Applications — The ability to apply moral standards and appreciate values in the work setting. Technology Competency — The ability to apply basic principles of technology, including keyboarding and data manipulation. Career Planning — The cultivation of a personal sense of direction and desire for improvement, including a willingness to learn. The Summary Worksheet for Step 2 provides a snap shot of areas for you to explore and gain information about the work industry(s) you may enjoy. As you explore the various ways of investigating the world of work, you may need to create several Summary Worksheets for this step, and refer back to the information often. How will you go about investigating the world of work? Explore the job and labor market? Connect by networking with people? Volunteer in your spare time?